Madrid-Levante high speed rail network is operated by Spanish railway operator Administrador De Infraestructuras Ferroviarias (Adif). Image courtesy of Jorgeosma Reyes Martínez. Madrid-Levante high speed rail network stretches 955km and is designed for operation at speeds of 300kmph. Image courtesy of Tyk. Renfe AVE Class Talgo 350 trains will run on the high speed railway line. Image courtesy of Hanspore. Signalling on the Madrid-Levante high speed rail network is managed by an ERTMS (European Rail Traffic Management System). "State owned Spanish railway operator Administrador De Infraestructuras Ferroviarias (Adif) is the operator of the line." The Madrid-Levante high speed rail network is one such network, which connects the capital city to the Mediterranean coast. The 955km high speed track is being built at an estimated cost of €12.5bn ($15.68bn), making it the most expensive railway project ever undertaken in the country. The network is designed for operation at speeds of 300kmph. It consists of a number of sections and is compatible for both passenger and freight operations. The Albacete-Alicante section is scheduled to open in 2012. The section between the cities of Murcia and Castellon is scheduled for opening in 2015. Opening of the last section, that stretches to Cartagena, is yet to be scheduled. State owned Spanish railway operator Administrador De Infraestructuras Ferroviarias (Adif) is the operator of the line. The European Union is providing a financial aid of €1.95bn ($2.45bn) towards the railway project. European Investment Bank (EIB) is also funding the project. The line starts from Puerta de Atocha station and heads towards Cuenca and Motilla del Palancar. A branch line, which stretches to Valencia and Castellon, emerges from the main line at Cuenca. The main line heads towards Albacete and La Encina. "The Madrid-Levante high speed rail network is one such network, which connects the capital city to the Mediterranean coast." At La Encina the line branches into different sections. A section of these branches connects to the Mediterranean Corridor through Barcelona and Almeria. A stretch from here heads towards Jativa and Valencia, and stretches towards the south-east up to Monforte del Cid. At this point a segment branch heads towards Alicante, while the main section heads towards Murcia and Cartagena. Trains heading towards Seville and the Spanish east coast will initially use the track between Madrid and Seville until Torrejon de Velasco. 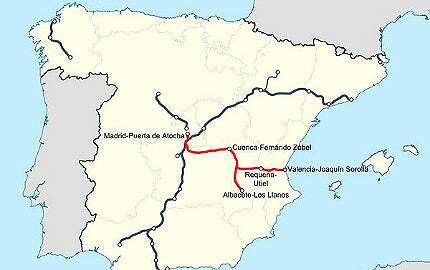 A railroad bed is planned to run parallel to the above route between Madrid and Seville, therefore providing two routes for Madrid. The Torrejon de Velasco – Motilla del Palancar section is the first section stretching 223.6km. It runs through the territories of Madrid, Toledo and Cuenca and Motilla del Palancar, joining the Albacete and Valencia section. It was opened in December 2010. Talgo 350 (T350) is a very high speed train developed by Patentes Talgo (Tren Articulado Ligero Goicoechea Oriol), a Spanish company. Motilla del Palancar – Albacete section is the most complex section as it crosses the Jucar River. It heads towards the city of Albacete after crossing the river. Motilla del Palancar – Valencia section is a 139km long stretch, starting from the link to Albacete section in Motilla del Palancar. It passes through Cuenca and Valencia provinces, and ends between Bunol and Valencia. Albacete – Almansa – La Encina – Xativa section is a 138.2km section in which the 100.5km track (in lberian gauge) is adopted for high speed operations. The remaining two parts Albacete – Alpera bypass and Alpera bypass – Nudo de la Encina, will be built. Xátiva – Silla Valencia section is a 59km long stretch along the Mediterranean Corridor parallel to the already existing conventional track. The Valencia – Castellon section stretches 55km and will reduce travel times between the two cities by 25 minutes. The 119km long La Encina – Alicante section will run from Encina bypass to Monforte del Cid, where it will branch in to two. One of the branches will head towards Alicante and the other towards Elche, Orihuela and the region of Murcia. Monforte Del Cid – Murcia / Cartagena section currently operates on Iberian gauge trains until the arrival of high speed trains. It has an approximate length of 8.9km. Renfe AVE Class Talgo 350 trains are planned to be used on the high speed lines. The train is aerodynamically designed so as to make it comfortably pass through large tunnels at high speeds. The Talgo 350 trains can run at speeds exceeding 300kmph. The Torrejon de Velasco – Motilla del Palancar section includes a 4.7km long tunnel through the Regajal Nature Reserve. Spain’s capital Madrid, home to over three million people, has one of the most extensive metro systems anywhere in the world. It also includes a 3.1km long Del Bosque tunnel through the Cuenca mountain range. A station at Cuenca is also planned for this section. Albacete station is being renovated for making it compatible with the high speed rail operation on the Motilla del Palancar – Albacete section. This station will also serve the line that connects to Alicante and Murcia. The Motilla Del Palancar – Valencia section includes 25km of tunnels, 11km of viaducts and a station near Requena and Utiel. It also has a 261m long viaduct on the Contreras reservoir. Other viaducts are over the Margo river and A3 road. The line passes through the 7.25km long Cabrera tunnel in the Sierra de la Cabrera mountain ranges. The La Encina – Alicante section includes the 1.4km long Vinalopo viaduct, Barrancadas tunnel (which crosses the Sierra de Camara Mountains) and Umbria de Salinas. The high speed line is equipped with latest communication technologies. It uses GSM-R (Global System for Mobile Communication-Railway) and ERTMS (European Rail Traffic Management System) signalling and safety systems. Adif, in association with IT firm Indra, will install Da Vinci control system on the high speed line. The system will implement centralised traffic control, landline and GSM-R communications, signage, energy remote control and video surveillance, and will manage and regulate rail traffic. Having first sanctioned a 160km/h (100mph) maximum speed as recently as 1986, Spain moved quickly to get high-speed rail into operation. It remains committed to long-term plans for the new network.